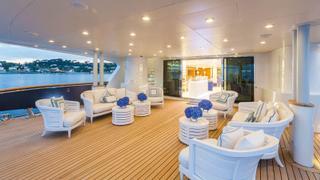 Malouf spends half the year on board with an area in the main saloon acting as an office. All yacht images by Quin Bisset. In the tell-it-like-it-is style of the Sydney Morning Herald, Ian Malouf is “king of the dumpsters” and “Australia’s richest garbo”. More poetically he’s an alchemist who has found a way to turn rubbish into gold, or at least dollars. Officially, however, he tends to be known as the founder and CEO of Dial a Dump Industries, aka DADI Group, the self-styled “leading waste management service provider and recycler in New South Wales”. We meet amid surroundings that could not be further removed from most people’s perceptions of a tip. Mischief, the 52.4 metre Baglietto-built, Francesco Paszkowski-designed superyacht that Malouf bought in 2015 and had comprehensively refitted, has a newly resprayed ultramarine hull and immaculate white-and-navy interiors. She is berthed in the Vieux Port at Cannes, where the annual film festival is in full swing and the beau monde are out in force. 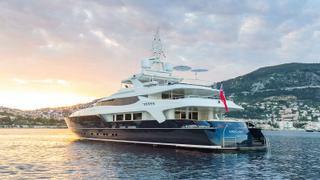 A week hence she will be 50km west in the Bay of Monaco for the Formula One grand prix. “Then we’ll cruise down to Italy,” he says. By the time he goes back to Australia, he’ll have been aboard about two and half months. “And then I’ll come back for September and October and hang out in Spain. We’ll stretch the season as long as we can.” He says he spends half the year afloat. “No one likes to do the dirty jobs,” he says. “But there’s money in trash.” Malouf has grown DADI from a one-man rubbish collection service he launched as a student in 1984 with A$700 (about £400) – he quit university six weeks into a law course to run it full-time – to a range of businesses from skip hire to recycling and the production of mulch, woodchip and aggregates to landfill and potentially energy generation. 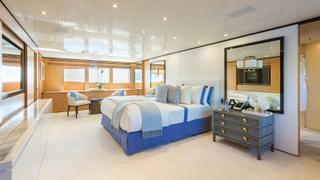 The cluster of desks and computer screens in one corner of the yacht’s main saloon act as his on board office. As a boy – he was the youngest of four – Malouf and his father would go out in a “tinny”, a small open aluminium dinghy with a 6hp engine, to catch tailor or bluefish. As he grew bigger, so the boats they owned became more substantial. But it was Malouf ’s first holiday on a 100ft yacht – he doesn’t recall its name – that he chartered with friends on Sardinia’s Costa Smeralda that opened his eyes to superyachts. “After that we had them in our system.” The end of their week came and they didn’t want to go home, so having spotted another boat they liked the look of in Porto Cervo, they “found the owner and just did a direct charter”. He was hooked. He began to charter regularly. And then in 2015, within 30 minutes of stepping aboard for the first time, he decided to buy what was then Blue Scorpion. Tellingly, he renamed her Mischief. There was another buyer lined up, who was prevaricating over the results of a survey. Malouf was undeterred. “I come from a machinery background. Back home I own 3,000 engines, so even if I’m not a mechanic, I run a phenomenal amount of equipment and can walk into an engine room and know I’ve got half a chance of making it work. So I just walked through, took a look, gave it my best guess and said I’d just take it as it was. I think I made the right decision.” And having undergone a substantial refit, inside and out, “it’s in beautiful order now,” he says. Not that ownership stops him wanting to experience life on other boats, especially when, as happened last year, he was offered $1 million for a three-week charter during the Australian school holidays. It struck him as too good an offer to turn down, so another party took temporary custody of Mischief, and he chartered a less expensive boat for his own family. 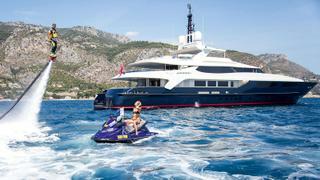 Despite his obvious affection for his Baglietto, he thinks Mischief will be on the market by the end of the year. “You fall in with this crazy system where you want something bigger,” he says. “It’s a bloke thing.” At which point he erupts with laughter. “Do I need a bigger one? No. But this is my hobby. And the whole process of looking for another yacht is just so much fun.” Fun is a word he uses 18 times in the course of an hour’s conversation. But I don’t think it’s an act: Malouf comes across convincingly as a fun guy. 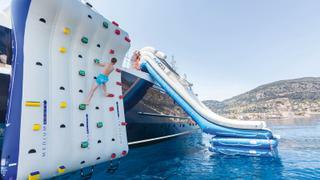 The boat is also well equipped with exercise and fishing equipment, not to mention the wherewithal for on-deck clay-pigeon shooting, a climbing wall that descends to the water, a slide and a floating sunbathing dock. There’s been no little investment in technology too. “Gadgetry: I love it!” he exclaims. Hence the gigantic, three by two metre video wall opposite the cocktail bar in the main saloon (“great for music videos and sports events” – rugby is another passion). And the bespoke app he developed so guests can order room service via their phones from a menu that even asks you to specify how hot you want your coffee. That’s how detail-driven he is. The proposition behind Ahoy Club is a little simpler. 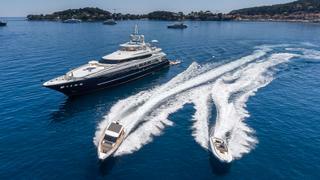 In essence it’s a platform that aims to connect those who want to charter directly with the owners of yachts. As he explains it, the website and app will enable users to find a boat they want to charter, ascertain immediately whether it’s available, book, pay a deposit by credit card and receive an automatically generated contract. At that stage the owner will still have the right to review and reject the contract but “if they accept it, the contract is formed, and everybody’s happy”. 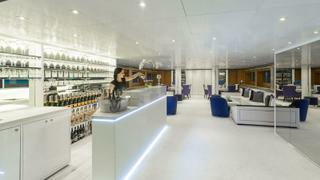 Established charter companies might argue that a human interface remains critical to the charter process – to advise on boats, settle any disputes and make sure the charter is specifically tuned to the client, from food and drink to itinerary and crew. But Malouf firmly believes automation is the future. So does he see himself as a disruptor? “I prefer improver,” he replies. Looking around his refitted yacht, it’s hard to argue with that.